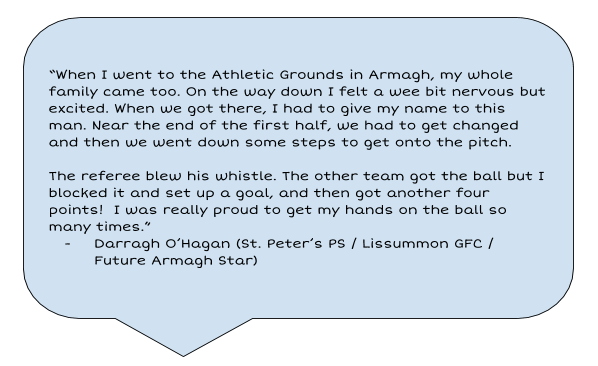 The Athletic Grounds in Armagh was the place to be on Sunday 21st October. The Intermediate Football Championship final saw Mr Tierney’s club, Mullaghbawn, take on St. Peter’s, Lurgan. Unfortunately, it wasn’t to be Mullaghbawn’s day, but that didn’t dampen the spirits of two of our own P7s, as they had been chosen to play in the half-time game of the Senior Championship Final between Ballymacnab and Crossmaglen. We are extremely proud to have seen Katie and Darragh play in front of such a big crowd at the Athletic Grounds. Their hard work and dedication to their school and club teams is a great example to other aspiring boys and girls. Hopefully it won’t be the last time that we see these two playing at Football Championships, and perhaps, someday… Croke Park! 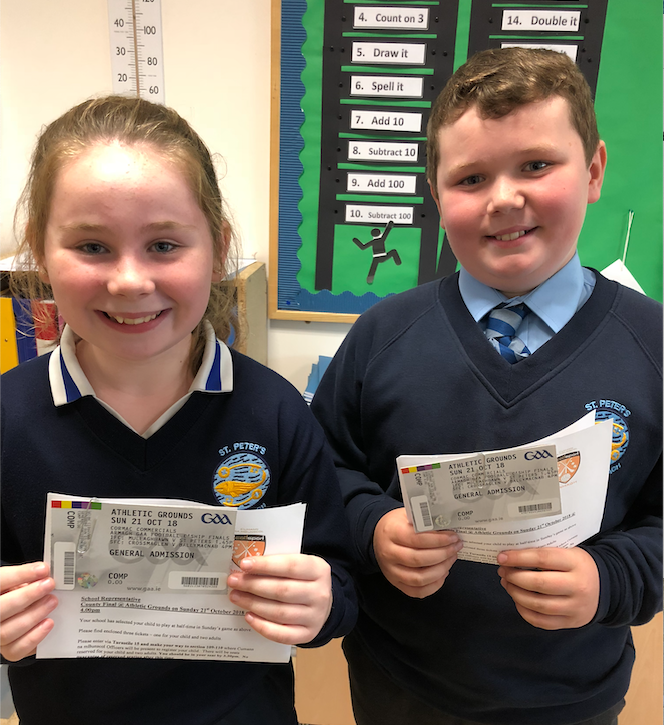 Well done Katie and Darragh. It was a long time before I got to play at the Athletic Grounds so I’m a bit jealous. Definitely a proud day, two great pupils and fine ambassadors for St. Peter’s. Sadly, unlike Master Tierney, I never got to play in Armagh.